APT Engineering Works., began operating in the year 1965, as a manufacturer, supplier, trader and exporter of a wide and the finest range of Cable Trays & Electrical Accessories. The diverse and commendable range is made up of products like Cable Trays, Earthing Material and Support Structure, that are widely acclaimed and asked for in the market. Manufacturing of this range is done in accordance with the set industry norms and guidelines, utilizing the finest raw materials and modern machines. Because of this, the offered range is known for its superior performance, strength and resistance to corrosion. In addition, the offered range is marked at the most affordable rate possible, for reasons of client satisfaction. We are exporting our products to South Korea, Oman, Sri Lanka, Bhutan, Indonesia and UAE. A.P.T. Delhi has a state-of-the-art infrastructural facility, laced with machinery and amenities, required for facilitating a number of the firm’s goals and objectives. In order to manage the firm’s management, in the most efficient and smooth manner, the facility has been parted into a number of highly operational units. The units lead by trusted and skilled professionals, direct all their efforts and work in a united manner to maximize the firm’s productivity and improve the standard of quality. Further, our abidance of work ethics and set industry guidelines, have helped us in the attainment of reputed clients like NTPC, BHEL and NFL. Under the strict and commendable supervision of our Manager Mr. A. K. Jain, we have managed to attain great heights of success in our existence of more than three decades. His managerial skills and ability to understand market changes, has always been one of our greatest assets. Manufacturing, Trading and Exporter of Cable Trays. The firm was established in the Year 1965 and has since then expanded in terms of Product and as well as Volume. It is a Private Limited Company which is limited by Shares. It was incorporated under the Indian Companies Act, 1956. We have established a sound manufacturing facility at our premises, which is sprawling over a wide area. Managed by a team of qualified technocrats, this facility is equipped with all the requisite machinery and technology that are needed to produce best-in-class products. These machines significantly accelerate the production rate and hence, allow us to meet with the bulk orders of patrons. Apart from this, regular inspection of this department is done by our technicians to ensure smooth functioning of all the fitted equipment. 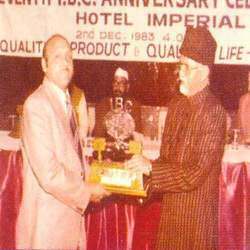 International Business Council's "Udyog Bhushan Award-1982-83"
International Business Council's 'Man of the Decade-1979-89"
International Friendship Society of India's "Vijay Rattna Award-1993"
India International Society for Unity's "Ratna Shiromani Award-1993"
In our endeavor of providing a quality-tested assortment of Cable Trays, we are assisted by a team of elite professionals. These experts are recruited by us after analyzing their past academic record and conducting some tests to test their knowledge in this domain. Apart from this, they maintain cordial relations with the patrons in order to understand and fulfill their exact requirements. We have got our own R & D facilities as we have our own fully furnished Laboratory for carrying out various tests. We have our own Internal Quality Control System to maintain our good quality standards. We possess various scientific & mechanical instruments used in measuring, weighing and several other tests.